The Center for Innovation and Entrepreneurship has a very specific mission—to identify and nurture high-growth, high-impact companies and to accelerate the entrepreneurial ecosystem in southeastern North Carolina. As our vision page notes, with a combination of event space for training, co-working space for "napkin-stage" startups, low-cost office space, and experienced mentors, we have created a great environment for startups in the growing city of Wilmington. Our unique events, centered around increasing sales, preparing successful SBIR grant proposals, and developing better investor presentations, will help entrepreneurs make better fundamental decisions at an early stage, setting them on the path to success within the local economy. There are two main ways that startups and entrepreneurs can utilize the CIE’s resources—through membership and through tenancy. “We want anyone and everyone who comes through our doors to become a member,” says Laura Brogdon-Primavera, the CIE Manager of Operations. There are multiple levels of membership depending on who you are and how big your startup (if you have one) is. Students and faculty of UNCW (as well as community college students) can receive a special annual rate, and UNCW alumni can also receive a discount. CIE membership entitles you to free attendance for all general events and a discounted rate for paid programs and events. It offers additional opportunities and recognition not available to non-members and supports the Center's resources to maintain and expand programs that support entrepreneurship in the Cape Fear region. If you choose to purchase a membership at the Startup level of $125 or higher, you have access to the services of the talented CIE Media Team, made up of senior UNCW film students. For a $200 annual fee, you can request up to ten projects per year of the Media Team. “We want anyone and everyone who has an idea, who has an existing business, who's at the startup-napkin stage to revenue stage to companies that've been around a while and are looking to scale, all the way up to our companies who are in existence and are stakeholder members,” Brogdon notes. There are two levels of tenancy: co-working space tenants and office tenants. Co-working space tenants receive all the benefits of normal membership, as well as 24/7 access to the premier co-working space at our facility for up to 2 employees. The resources associated with the co-working space include free wifi (obviously! 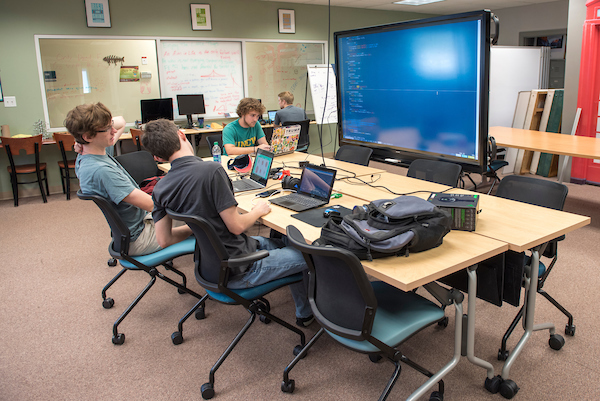 ), an Open Device Lab, Randall Library resources, a media room with Film Studies student support, access to UNCW intellectual capital, mentoring from CIE advisers and experts, and unlimited use of conference rooms and event space. Office tenants receive all the same benefits of normal membership, all the benefits of co-working space tenants, and a private or shared office space at the CIE facility. Tenancy is the best option for startups at the “napkin stage.” You have an idea and the CIE “puts you on a path to accelerate the growth of your company with 18 months,” Brogdon says. Ideally, within 18 months, tenants have grown enough that they require more office space somewhere else in Wilmington. The membership application is an easy process that you can fill out online here. If you think tenancy would suit you and your business, you can give us a call at (910) 962-2206, email us at cie@uncw.edu, or, best of all, stop by the office to begin the process of applying for tenancy. Check back on the website often or follow us on Facebook, Twitter, and Instagram to keep up with more of the CIE's events and news.